From the World's #1 Recommended Brand*, Finish All In 1 dishwasher detergent tablets give you an amazing clean and shine - which means you will never have to re-wash your dishes again. Our Powerball supercharges the tablet, bursting into action to scrub away the toughest food residues like dried-on food, such as lasagna and oatmeal. Our powerful cleaners remove even the toughest stains, like coffee & tea, and gently scrub your dishes & glasses sparkling clean. All In 1 tablets (individually wrapped and pre-measured) are safe for septic systems. *Recommended by more dishwasher brands worldwide (More dishwasher brands recommend Finish Products worldwide than any other brand). World's #1 Recommended Brand* (*Recommended by more dishwasher brands worldwide). No need to pre-soak or pre-rinse with Powerball cuts through grease and scrubs away burnt & dried-on food. 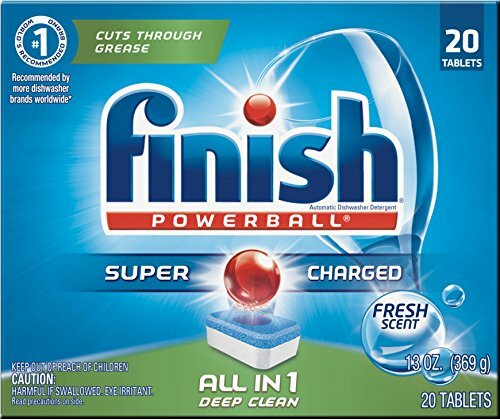 Finish Powerball Tabs are 3X concentrated cleaning power of regular Finish powder. Removes tough stains like tea & coffee. Individually wrapped, pre-measured dishwasher tablets. To use properly, remove one tablet from wrapper and place in the main detergent cup & close completely. Safe for septic systems. If you have any questions about this product by Reckitt & Benckiser, contact us by completing and submitting the form below. If you are looking for a specif part number, please include it with your message.